Although I recommend the use of a thermometer, sometimes it’s convenient to know how you can also manage without. If you mix water at two different (but known) temperatures, you can easily calculate the temperature after mixing. Just multiply the temperature of each part with the relative amount. For example, if you have 3 dL at 100 °C and 7 dL at 10 °C (which happens to be the approximate temperature of my tap water), this gives (3 dL x 100 °C + 7 dL x 10 °C) / 10 dL = 37 °C which is just perfect for dissolving fresh yeast when making bread. Are there any practical applications of this? Yes – a simple, but elegant way to prepare fish would be to drop a fish of known weight and temperature (fridge @ 4 °C or freezer @ -18 °C) into water that has been brought to boil. Cover pot and turn off heat. The amount of water would be calculated based on the desired temperature of the fish. We are assuming here that there is no heat loss to the surroundings, which of course isn’t quite true. How fast pot of water will cool depends on how much water you use and on the pot. This can be corrected for, and luckily someone has already done it. More on this in my post on how to cook fish in cooling water. We can apply the temperature calculation from above to figure out roughly what the temperature will with this cooking method. 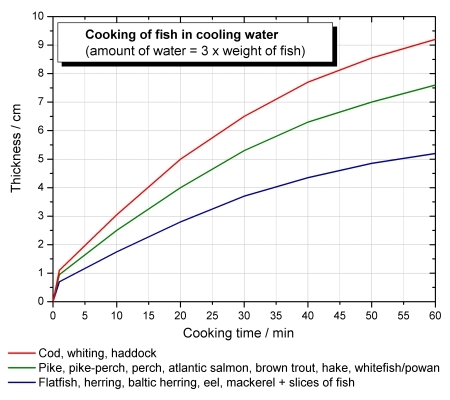 800 g of fish from the fridge (4 °C) and 2,4 L of boiling water gives a temperature of (0,8 x 4 °C + 2,4 x 100 °C) / 3,2 = 76 °C. The cooling curves for a pot with 2,5 L of water suggest a temperature loss of 15-20 °C in 30 min which would bring us down to 55-60 °C which – considering that no thermometer is used – is quite good. I have previously written about how you can cook a perfect steak with a simple DIY sous vide technique. Of course low temperature cooking applies equally well to fish with the only difference that the temperature can be turned down even lower. A slightly different approach for cooking fish was presented by Haqvin Gyllenskí¶ld in the Swedish book “Koka, steka, blanda” from 1977, which I became aware of through í–sten Dahlgren’s book “Laga mat – hur man gí¶r och varfí¶r”. In stead of keeping the fish at a constant temperature (which requires quite some attention unless you have a thermostated waterbath), in this method, as the hot water cools, the temperature of the fish increases until they’re at the same temperature. Need help on fish names in different languages? Yeah, me too!